This puppy came in with an embedded collar! Idiot owners didn't realize that puppies GROW and so does the size of their necks. In spite of the pain she suffered, she is just the sweetest, most loving little girl. I am a female, tan and white Jack (Parson) Russell Terrier mix. Shelter staff think I am about 10 months old. I have been at the shelter since May 14, 2018. 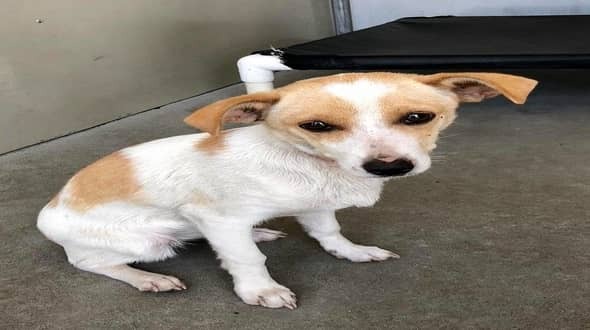 Fidonation, if you or someone you know is interested in giving this pup the forever family he rightfully deserves, please contact the san bernardino city animal shelter at (909)-384-1304, and reference the shelter ID #A514053. 0 Response to "Puppy surrendered with embedded collar! idiot owners didn't realize that puppies grow and she suffered"